Charles Griffin commanded a division in the V Corps. Like Meade, he had an explosive temper (Library of Congress). Theodore Lyman recounts the events of March 29 in more detail. [To-day] nothing to note, but that there was a steady and drenching rain the whole livelong day, which reduced these sandy, clayey roads to a pudding or porridge, as the case might be. The chief Quartermaster told me it was the worst day for moving trains he ever had had in all his experience. A train of 600 waggons, with the aid of 1000 engineer troops, was fifty-six hours in going five miles! Theodore Lyman’s letter is from Meade’s Headquarters, 1863-1865: Letters of Colonel Theodore Lyman from the Wilderness to Appomattox, pp. 328-30. Edited by George R. Agassiz. Boston, Massachusetts Historical Society, 1922. Available via Google Books. The relationship between George Meade and Ulysses Grant is often portrayed as antagonistic, with Meade complaining about the general-in-chief. That wasn’t always the case. Here we have another example of Meade defending Grant against charges he hadn’t done enough. Meade, of course, knew all too well what that kind of criticism felt like. 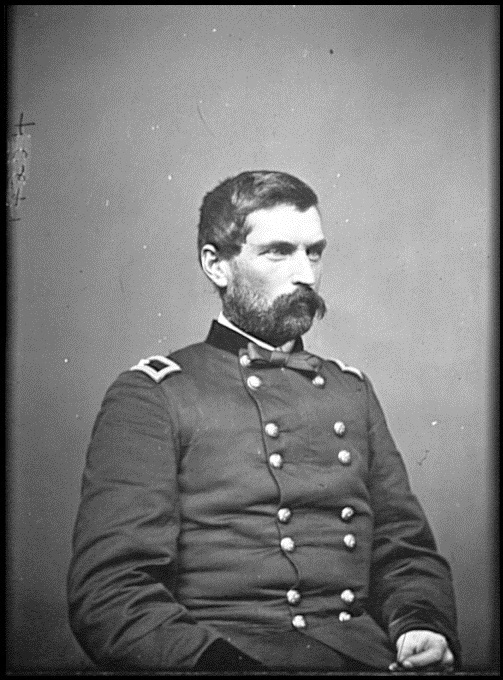 John Gibbon had commanded a division in the II Corps. 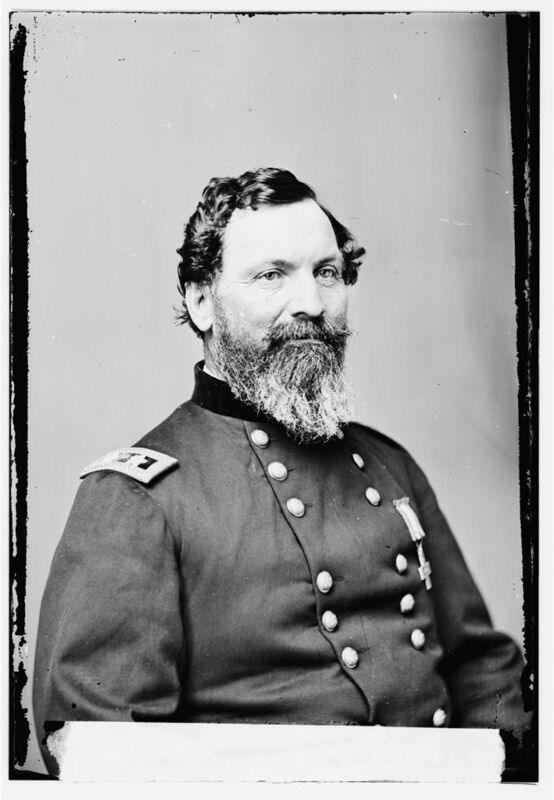 Webb is Alexander Webb, who had commanded a brigade under Gibbon at Gettysburg and had been serving as Meade’s chief of staff. John Gibbon (Library of Congress). I am sorry to hear what you write people say of Grant, because it is unjust, and I do not approve of injustice to any one. Grant undoubtedly has lost prestige, owing to his failure to accomplish more, but as I know it has not been in his power to do more, I cannot approve of unmerited censure, any more than I approved of the fulsome praise showered on him before the campaign commenced. Butler’s removal has caused great excitement everywhere. He will have some very powerful influences exerted in his favor, and he will use them efficiently. I see Wilson has moved in the Senate that the Committee on the Conduct of the War enquire and report on the Wilmington fiasco. This is the beginning of a war on Grant. Gibbon has been assigned to the Twenty-fourth Corps, in Ord’s place, who takes Butler’s army. This has pleased him very much, and when here to-day to say good-by he was in quite a good humor. I shall probably have to send Webb to Gibbon’s division, although I believe he would prefer remaining on my staff. 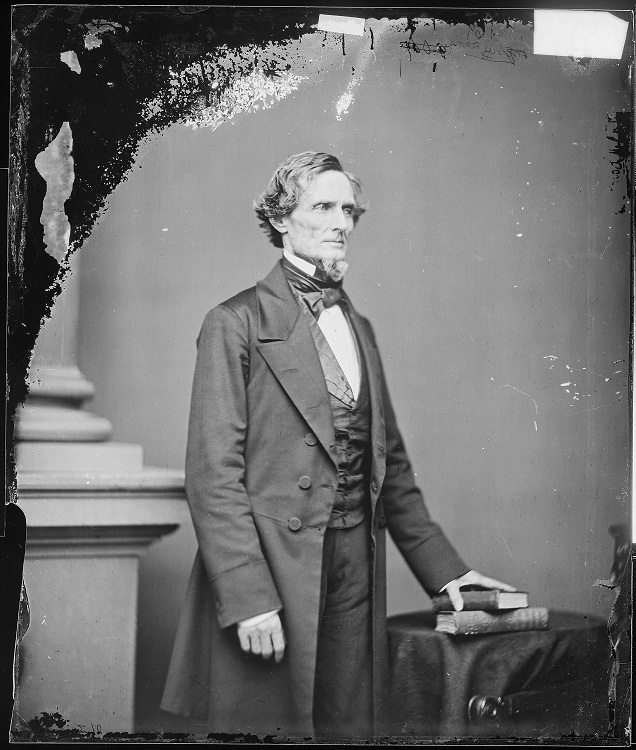 Confederate President Jefferson Davis (National Archives). In his annual address to the Confederate Congress on November 7, 1864, President Jefferson Davis raised the troubling (for the South) question of arming slaves to aid in the war. He approached the subject delicately, suggesting that maybe 40,000 slaves could be used only as pioneers and engineers. “If the recommendation above made for the training of 40,000 negroes for the service indicated should meet your approval, it is certain that even this limited number, by their preparatory training in intermediate duties, would form a more valuable reserve force, in case of urgency, than threefold their number suddenly called from field labor, while a fresh levy could, to a certain extent, supply their places in the special service for which they are now employed.” Meade was correct that this indicated a greater desperation on the part of the Confederacy. However, it wasn’t until March 1865 that the Confederate Congress approved the use of African-Americans as soldiers. By then it was too late. See below for Theodore Lyman’s impression of the British visitor. To-day I had a visit from a Colonel Coles, of the English Army, who is the Military Commandant of New Brunswick. He was quite a gentlemanly person. I took him around our lines and showed him all that was to be seen. Grant has gone to-day to pay a visit to Admiral Porter, at Fortress Monroe, and as Butler is absent, this leaves me in command of all the forces operating against Richmond. I suppose you have seen Mr. Davis’s Message to the Confederate Congress. Although a dignified and well-written document, to my mind it betrays unmistakable evidences of despondency. His proposition to arm and free forty thousand slaves, to make engineer soldiers, is most significant, for nothing but an acknowledged exhaustion of the white race could ever make him willing to free and arm the black race. The idea of limiting the number to forty thousand, and making them engineer soldiers, simply means that this is an experiment, the result of which is doubtful, and until the fidelity of the race is tested, it is better not to have too many. I think this is prudential on their part, for I cannot believe they will get the blacks to fight for them. Gibbon was here to-day, the first time I have seen him since his return. I judge from the tone of the Tribune, Washington Chronicle, and other Administration papers, that there is a disposition on the part of the successful party to be magnanimous and invite harmony among all the friends of the Union. 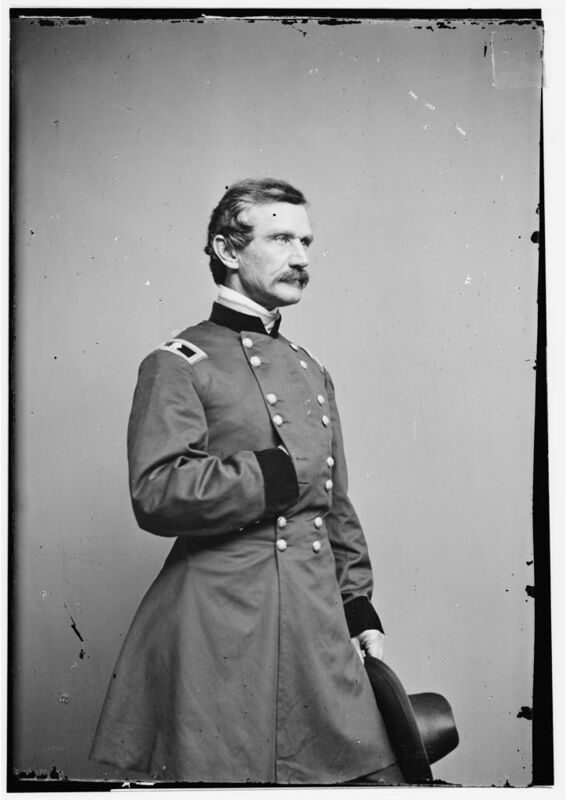 I see it reported the President has declined McClellan’s resignation, and it is said is going to give him a command. I doubt the latter part, but think the former very probable. I have no means of hearing or knowing anything that is going on till it is made public. I never go to City Point, and Grant does not come here, so that I am not au courani des affaires. In his letter today, George Meade mentioned the visit of Colonel Cole from the British Army, the latest European to show up and observe the Army of the Potomac. Meade doesn’t spend much time on the visit, so we must rely on Theodore Lyman for a more expansive (and typically comic) account. 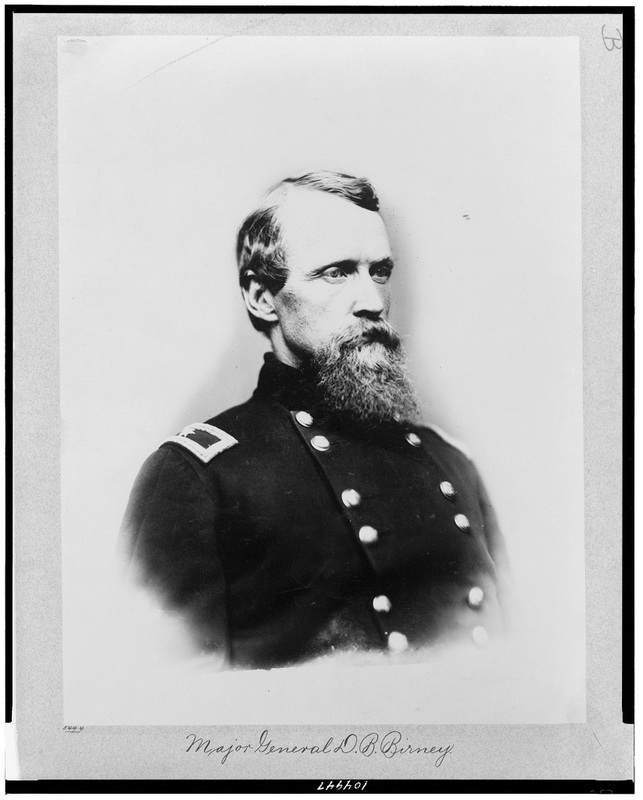 He also provides a snapshot of John Gibbon, who commanded a division in the II Corps. Meade’s correspondence taken from The Life and Letters of George Gordon Meade, Major-General United States Army, Vol. 2, (New York: Charles Scribner’s Sons, 1913), pp. 241-2. Available via Google Books. Theodore Lyman’s letter is from Meade’s Headquarters, 1863-1865: Letters of Colonel Theodore Lyman from the Wilderness to Appomattox, pp. 267-9. Edited by George R. Agassiz. Boston, Massachusetts Historical Society, 1922. Available via Google Books. Both Meade and Lyman mention the hot, dry weather that made the Petersburg front miserable for both armies. In addition, Meade mentions the Crapsey or Cropsey affair and how it has helped erase his presence in the newspapers. The wound of Hancock’s he mentions is the one the general received on the third day at Gettysburg. David Bell Birney has been in command of the II Corps while Hancock recovers. Gibbon is John Gibbon, one of Hancock’s division commanders. Francis Markoe Bache, Meade’s nephew (Library of Congress). 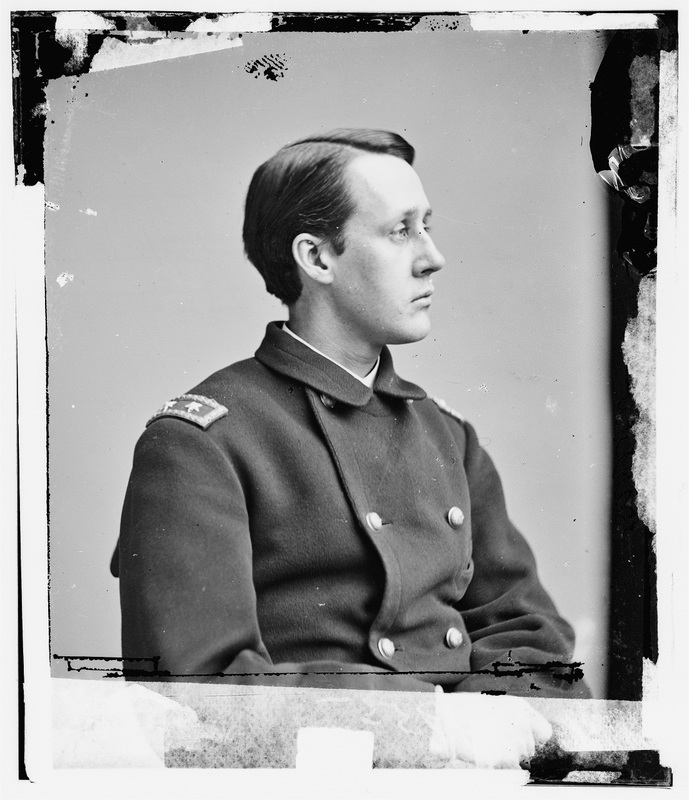 Francis Markoe Bache was Meade’s nephew and had joined his uncle’s staff from the 16th U.S. Infantry. When Lyman first met him, he called Bache “a remarkably empty-headed and ill-bred young man.” The two aides did not speak to each other for several months, until Bache finally apologized for his rudeness. General Meade had served under Bache’s father—who had married one of his sister’s—building lighthouses before the war. We have had for ten days past most intensely hot weather, and in consequence have desisted from carrying on any more active operations than were absolutely necessary. Grant being at City Point, some eight miles distant, I see but little of him. He paid me a visit of an hour or two day before yesterday. I received a few days ago a very kind letter from Cortlandt Parker, expressing much consideration for me in my present position, and saying it was well known how much of the work I was doing, and how little of the credit I was getting. Among other matters he alluded to the Cropsey affair, and said he was at George Harding’s when his brother came in with the news. Both the Hardings, he said, were quite excited, George the less so of the two; and Cortlandt thought he convinced him I was right, and advised me to write to him to endeavor to smooth it over. This I do not see how I can very well do, because I got Markoe Bache to write to him when the affair occurred, and to send him Cropsey’s confession, which he made, hoping by its publication in the Inquirer to get off. I asked Markoe to tell Mr. Harding that, as I could not let Cropsey off, he was at liberty to do as he pleased about the letter, though in my judgment the cause of truth and justice demanded its publication. The letter was never published, and the public are to this day ignorant of the real character of Cropsey’s offense. Hancock’s wound discharged a big piece of bone the other day, and since then he has rapidly improved, and expects in a day or two to return to duty. In the meantime Birney has done very well. Gibbon, whom I suppose you know I have finally succeeded in getting promoted, has been under the weather, but was about to-day. And now Lyman, who remains busy serving as tour guide for the army’s two French guests. I can only say that I have “sweltered” to-day—that is the word; not only has it been remarkably broiling, but this region is so beclouded with dust and smoke of burning forests, and so unrelieved by any green grass, or water, that the heat is doubled. We have had no drop of rain for twenty days, and but a stray shower for over a month. It is hardly necessary to say that neither army is what it was: the loss of a large proportion of the best officers, the nervous prostration of the men, the immense destruction of life, all tend to injure the morale and discipline and skill of both parties. As to the next step, I do not know; Grant is as calm and as apparently sure as ever. I have got from the region of fighting now, to the realm of lying idle, and it will not be so easy to fill a daily sheet. General Meade asked me to show the Gauls somewhat about; so I clapped them on their two horses, which they had from General Grant, and took them by easy stages to General Wright near by. The good General was comfortably in the woods. I say comfortably, because everything is relative. I mean he had his tents pitched and had iced water, two important elements. He speaks no French—De Chanal no English—so they smiled sweetly at each other. Old D. C. ought to be ashamed of himself. He married an American wife, but, like a true Gaul, utterly refused to learn a word of English. It is ever a part of a Frenchman’s religion to speak no language but his own. Little grasshopper Guzman chirped away and made up for two. Then Colonel Kent rode out with us, as a matter of politeness (for I knew that part of the line as well as he), and we showed them how our men made breastworks of rails, logs, and earth; how they lived and cooked; and all sorts of things. After which I took them out towards the picket line and showed them the country, and a tract of dense, young pines, through which our men advanced in double lines—a feat which I can never understand, but which is performed nevertheless. By this time, both distinguished foreigners being powdered a la marquise, I took them home, only showing them, before coming in, one more thing, only too characteristic of our war—the peculiar graves of our soldiers, marked each by a piece of cracker-box, with the man’s name in pencil, or hastily cut with a knife. I recollect sitting on the high bank of the Rapid Ann, at Germanna Ford, and watching the 5th and 6th Corps as they marched up from the pontoon bridges; and I remember thinking how strange it would be if each man who was destined to fall in the campaign had some large badge on! There would have been Generals Sedgwick, Wadsworth, and Rice, and what crowds of subordinate officers and of privates, all marching gaily along, unconscious, happily, of their fate. Meade’s correspondence taken from The Life and Letters of George Gordon Meade, Major-General United States Army, Vol. 2, (New York: Charles Scribner’s Sons, 1913), pp. 208-9. Available via Google Books. Theodore Lyman’s letter is from Meade’s Headquarters, 1863-1865: Letters of Colonel Theodore Lyman from the Wilderness to Appomattox, p. 178-80. Edited by George R. Agassiz. Boston, Massachusetts Historical Society, 1922. Available via Google Books. Alfred Waud identified this drawing from June 3 as “7th N.Y. Heavy Arty. in Barlows charge nr. Cold Harbor Friday June 3rd 1864.” Click to enlarge (Library of Congress). “I always regret the last assault on Cold Harbor was ever made.” So wrote Ulysses S. Grant in his memoirs. He had much cause for regret. One hundred and fifty years ago Union soldiers made a doomed attack on entrenched rebel lines. In about a half hour some 7,000 of them fell as casualties. In his letter of June 3, Theodore Lyman presents a clear-eyed account of what he say during the battle, without sugar-coating the final result. We had very severe fighting this morning, all along the lines. If you look on the map you may follow our lines. The line of battle faced westerly, towards Gaines’s Mill and Mechanicsville, with a corps covering the right flank, and the left refused (a wing is “refused” when it is swung back from the direction of the main line). In some sort this was the battle of Gaines’s Mill reversed. . . . The Rebel lines were about parallel with ours and they were throwing up dirt as hard as they could. No country could be more favorable for such work. The soldiers easily throw up the dirt so dry and sandy with their tin plates, their hands, bits of board, or canteens split in two, when shovels are scarce; while a few axes, in experienced hands, soon serve to fell plenty of straight pines, that are all ready to be set up, as the inner face of the breastwork. I can’t say I heard with any great hope the order, given last night, for a general assault at 4.30 the next morning! You see Wright and Smith took their front line and drove them back Wednesday afternoon. Thursday afternoon was twenty-four, and Friday morning would be thirty-six hours, for them to bring up and entrench their whole army. If we could smash them up, the Chickahominy lay behind them; but I had no more hope of it, after Spotsylvania, than I had of taking Richmond in two days. Half-past four found us at Kelly’s, the Headquarters of General Wright; the brave General himself, however, had gone to the front. At that moment the cannon opened, in various directions, and the Rebels replied vigorously. There has been no fight of which I have seen so little as this. The woods were so placed that the sound, even, of the musketry was much kept away, and the fighting, though near us, was completely shut from view. All the warfare for us was an occasional roundshot, or shell, that would come about us from the Rebel batteries. In the direction of the 18th Corps the crash of the musketry was very loud, but elsewhere, scarcely to be noticed. . . . About five we had a gleam of hope for our success. News came that Barlow had carried their works and taken seventeen guns; and so he did; but it is one thing to get in, another to stay in. His men advanced heroically and went over the breastworks with a rush; but the enemy had reserves massed behind, well knowing that his extreme right was seriously threatened. Before our supports could get up, their forces were down on our men, while a heavy enfilade of canister was kept up from flanking batteries. Barlow was driven out with heavy loss, and succeeded in getting off only about 300 of the prisoners he took. Like good soldiers, however, his men stopped and turned about, close to the works, and there entrenched themselves. At six we got notice that Russell’s division could not carry the line in their front. Ricketts, however, on the right of the 6th Corps, got their first line, and so did the 18th Corps on his right; but the 18th people were forced back, and this left Ricketts a good deal exposed to enfilade; but he held on. A singular thing about the whole attack, and one that demonstrated the staunchness of the troops, was, that our men, when the fire was too hot for them to advance and the works too strong, did not retreat as soldiers often do, but lay down where some small ridge offered a little cover, and there staid, at a distance from the enemy varying from forty to perhaps 250 yards. When it was found that the lines could not be carried, General Meade issued orders to hold the advanced position, all along, and to trench. The main fight lasted, I suppose, some three hours, but there was sharp skirmishing and artillery firing the whole day. 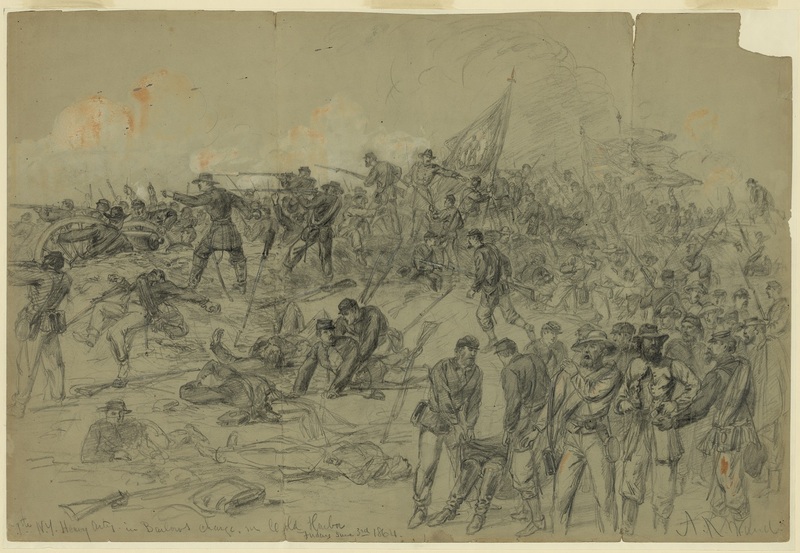 The Rebels threw canister in large quantities, doing much damage. . . .
“Barlow and Gibbons charge between the Mechanicsville road and swamp, June 3rd, 1864.” By Alfred Waud. Inscribed on the back: “This was a prominent position at the battle of Gaines Mill 1862. Our line was then at right angles to the present advance and faced to the right. Barlow charged to the left of the house, and Gibbon on the right.” Inscribed vertically: “Gains [sic] Mills or Cold Harbor/Gen Barlows & Gibbons June 3rd 1864.” Click to enlarge (Library of Congress). In the afternoon came Wright and Hancock, with their Staff officers, to consult with General Meade. They looked as pleasant as if they had been out to dine, instead of standing all day with shells, bullets and canister coming about them; for we now have a set of corps commanders who, in action, go, as they say, where they “can see”; which means sitting calmly in places where many people would be so scared they wouldn’t know the left wing from the right. Which reminds me of a ludicrous circumstance—there always is something of the ludicrous mixed in every tragedy. Three or four vulgar and very able-bodied civilians had got down to the army, in some way or other, and were at our standpoint for a little while. Having come from the White House and hearing little musketry, they concluded it would be quite safe to go further to the front. “Come,” said one, in a flippant way, “let’s go forward and see the fun.” So off they trotted down the Gaines’s Mill road. One of Wright’s aides said they came pretty soon, as far as where they were standing. All was quiet, but these braves had hardly dismounted when the Rebel guns again opened and the shells came with fearful precision over the spot! One gentleman, a fat man, rushed wildly to his horse, convulsively clutched the mane and tumbled on the saddle, galloping hotly off. But it so happened that two successive shells, passing with their hideous scream, burst just behind his horse, giving him the wings of panic! The other cit, quite paralyzed, lay down flat behind a ridge; in a few minutes he looked up at a Staff officer and, with the cold sweat rolling off him, exclaimed: “Oh! I wish they would stop! Don’t you think, sir, they will stop pretty soon?” What became of the third I know not; but they all “saw the fun.” Not a thing did I have to do till six in the evening, when General Meade told me to go to General Birney, ascertain his position and what he thought of the force in his front; then keep on to Warren and ask him if he could so close in his Corps to the left as to set Birney free to return to the Second Corps. I found General Birney, with his usual thin, Puritanic face, very calmly eating tapioca pudding as a finish to his frugal dinner. He remarked drily that his man had selected that hollow as particularly safe; but, as half a dozen shells had already plumped in there, he did not exactly believe the theory a good one. I had a great mess finding General Warren. * First I went, by the road leading through the woods, to Bethesda Church. There were his aides and his flag: but the General had “ridden out along the lines”—confound that expression! That is the luck of a Headquarters aide. You say: “Is the General here?” “No, sir, he has gone, I believe, along the line.” “Do you know where?” “Well, Colonel, he did not say exactly; but, if you will follow down the breastworks, I think you will find him.” (Delightful vision of a line of two miles or so of breastworks with the infantry safely crouched behind, and you perched on a horse, riding down, taking the chance of stray shot, canister, and minie balls, looking for a general who probably is not there.) The greatest piece of coolness is when you are advised to make a short cut by the picket line! . . .
Warren looks care-worn. Some people say he is a selfish man, but he is certainly the most tender-hearted of our commanders. Almost all officers grow soon callous in the service; not unfeeling, only accustomed, and unaffected by the suffering they see. But Warren feels it a great deal, and that and the responsibility, and many things of course not going to suit him, all tend to make him haggard. He said: “For thirty days now, it has been one funeral procession, past me; and it is too much! To-day I saw a man burying a comrade, and, within half an hour, he himself was brought in and buried beside him. The men need some rest.” . . .
At nine at night the enemy made a fierce attack on a part of Gibbon’s division, and, for a time, the volleys of musketry and the booming of the cannon were louder, in the still night, than the battle had been by day. But that sort of thing has not done with the Rebels, since the brilliant attack of Johnson, the second night of the Wilderness. This time they were repulsed completely. It was then that our men called out: “Come on! Come on! Bring up some more Johnnies! You haven’t got enough!” . . .
*“I do think there has been too much assaulting, this campaign\ After our lessons of failure and of success at Spotsylvania, we assault here, after the enemy had had thirty-six hours to entrench, and that time will cover them over their heads and give them slashings and traverses besides! The best officers and men are liable, by their greater gallantry, to be first disabled; and, of those that are left, the best become demoralized by the failures, and the loss of good leaders; so that, very soon, the men will no longer charge entrenchments and will only go forward when driven by their officers.”—Lyman’s Journal. The costs of war. 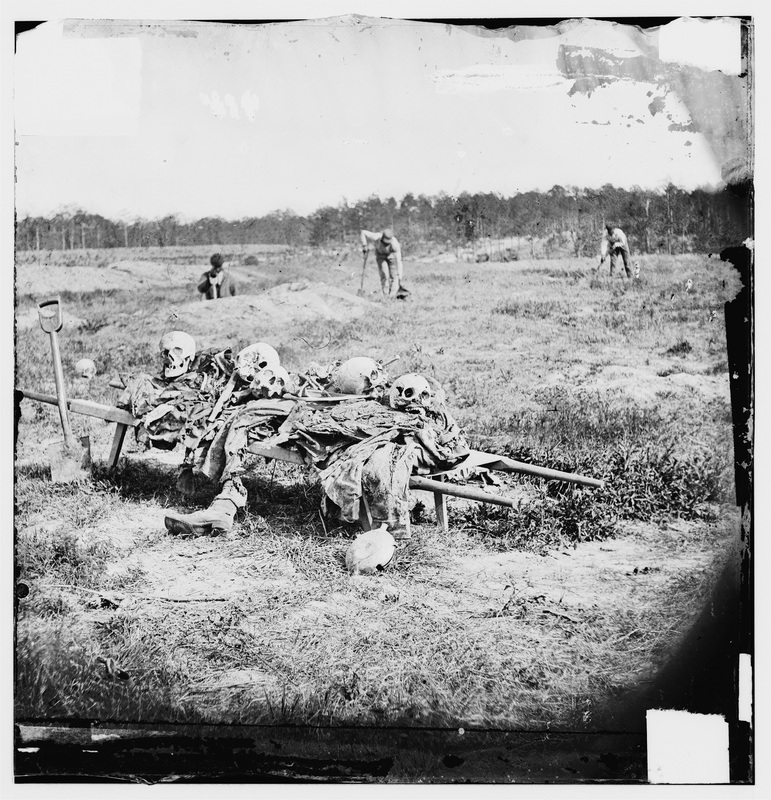 The remains of dead soldiers being collected at Cold Harbor after the war (Library of Congress). Theodore Lyman’s letter is from Meade’s Headquarters, 1863-1865: Letters of Colonel Theodore Lyman from the Wilderness to Appomattox, pp.143-8. Edited by George R. Agassiz. Boston, Massachusetts Historical Society, 1922. Available via Google Books. 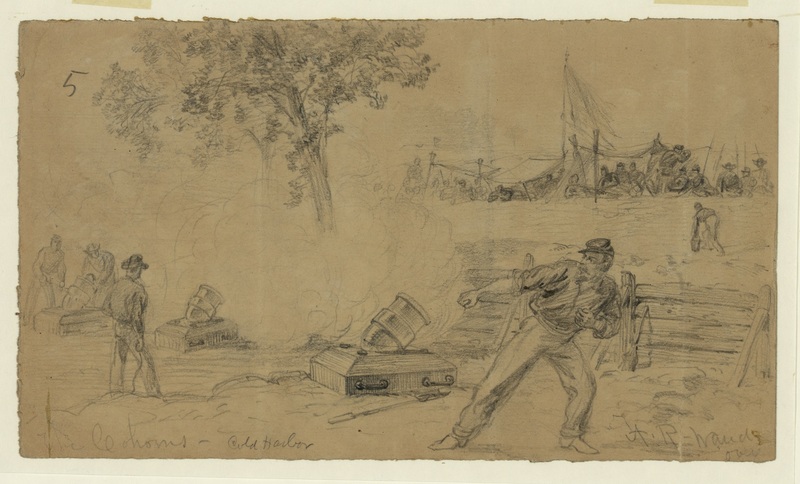 Alfred Waud sketched the firing of a cohorn mortar at Cold Harbor. Click to enlarge (Library of Congress). John Gibbon explains some Biblical history in Theodore Lyman’s letter from May 31. Gibbon had been born in Philadelphia but he grew up in North Carolina. When war broke out he remained loyal to the Union, although three of his brothers joined the other side. 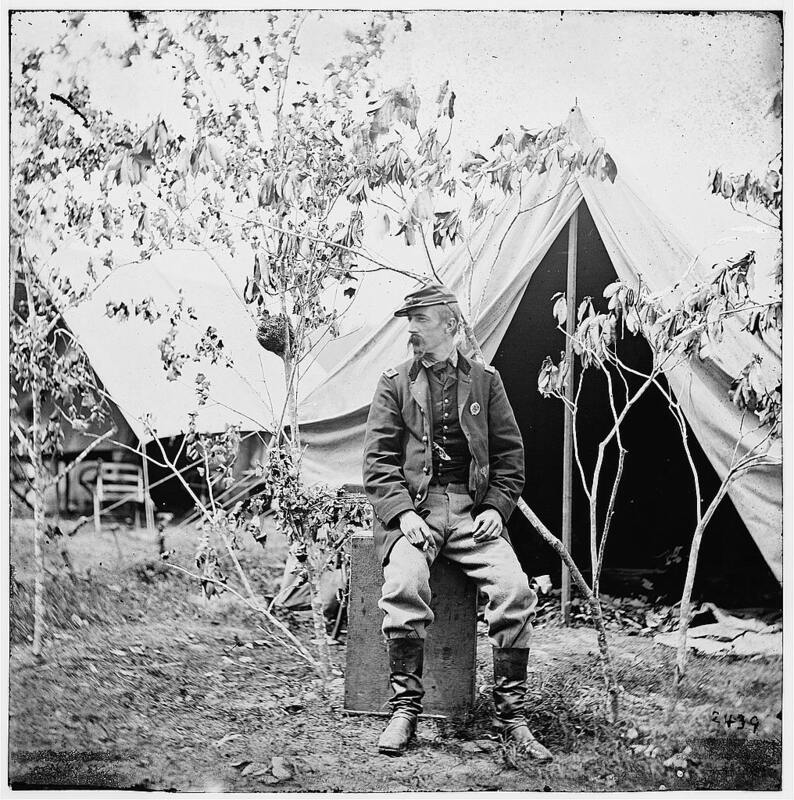 Badly wounded at Gettysburg, he commanded a division of the II Corps. There will be more about the arrival of William H. “Baldy” Smith and his XVIII Corps from Butler’s Army of the James in Lyman’s next letter. Last night, what with writing to you and working over some maps of my own, I got to bed very late, and was up tolerably early this morning, so to-day I have passed a good deal of time on my back fast asleep; for the General has not ridden out and has sent out very few officers. As I implied, to-day has been an occasion of Sybarite luxury. What do you think we mustered for dinner? Why, green peas, salad, potatoes, and fresh milk for the coffee! Am I not a good forager? Yes, and iced water! The woman (a fearful Secesh) asked two dollars for half a bushel of ice; upon which I, in a rage, sent a sergeant and told him to pay only a reasonable price and to take what we needed. But, in future, I will not pay for ice; it costs these Rebels nothing, and they can’t eat it. For food I will always pay the scoundrels. They have usually plenty of ice for the hospitals, and the bands are kept there to play for the wounded, which pleases them. The Sanitary are doing, I believe, a great deal of good at the rear, between this and Washington. There is room for any such people to do good, when there are such multitudes of wounded. I was amused to read a letter from one of the Sanitaries at Fredericksburg, who, after describing his good works, said that, for eight days, his ears were “bruised by the sound of cannon.” To me, Fredericksburg and Montreal seem about equally far away! Brigadier General John Gibbon. 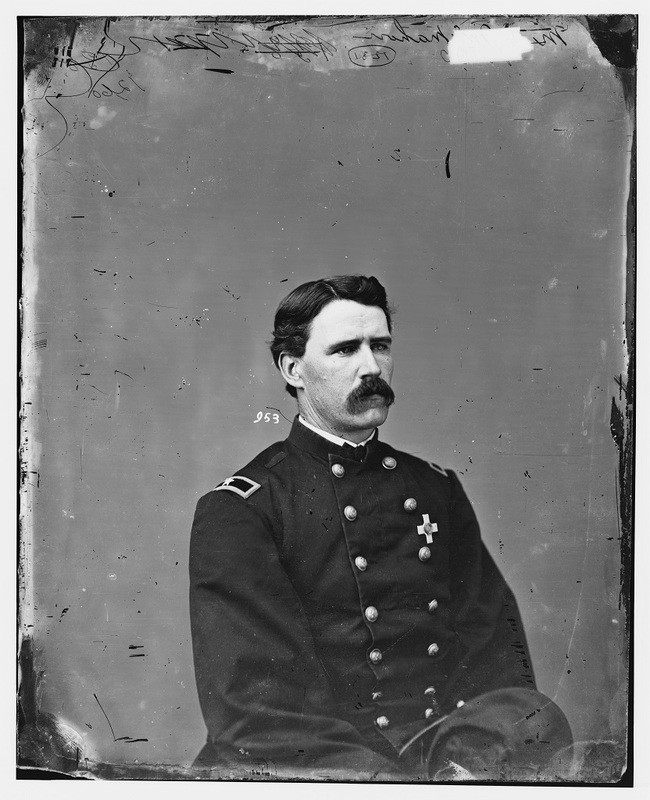 He became a major general in June 1864 (Library of Congress). The armies lay still, but there was unusually heavy fighting on the skirmish line the whole time; indeed there was quite an action, when Birney, Barlow, and Wright advanced and took the front line of the enemy. We used, too, a good deal of artillery, so that there was the noise of battle from morning to night. We took in some cohorn [coehorn] mortars, as they are called. These are light, small mortars, that may be carried by two or three men, and are fired with a light charge of powder. They throw a 24-lb. shell a maximum distance of about 1000 yards. As these shells go up in the air and then come down almost straight, they are very good against rifle-pits. General Gibbon says there has been a great mistake about the armies of Israel marching seven times round Jericho blowing on horns, thereby causing the walls to fall down. He says the marching round was a “flank movement,” and that the walls were then blown down with cohorns. Some of the heavy artillerists of the German regiment were first sent to fire these mortars; but it was found that they could give no definite account of where the projectiles went, the reason of which was that, every time they fired, the officer and his gunners tumbled down flat in great fear of Rebel sharpshooters! “Baldy” Smith arrived, by steamer, at Whitehouse, from Bermuda Hundreds, with heavy reinforcements for this army. 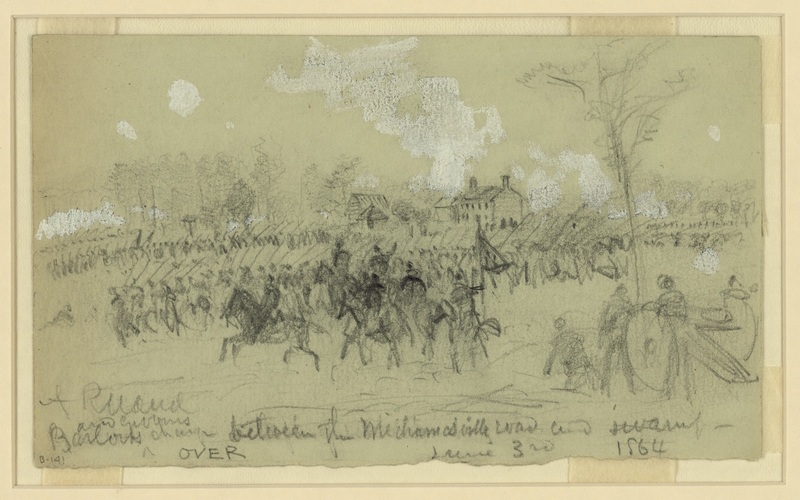 The Rebels, on their side, have been also bringing up everything—Breckinridge from the valley of the Shenandoah, Hoke from North Carolina, and everything from the South generally. . . . General Wilson’s division of cavalry was sent out towards our rear and right, to cover that quarter and to continue the destruction of the railroads below Hanover Junction. General Sheridan, with the remaining cavalry, swung round our left flank and pressed down towards Shady Grove and Cool Arbor (this name is called Coal Harbor, Cold Harbor, and Cool Arbor, I can’t find which is correct, but choose “Arbor” because it is prettiest, and because it is so hideously inappropriate). In vain I try to correct myself by the engineer maps; they all disagree. The topographical work of the engineers is rather uphill in this country. Before we opened the campaign the engineers prepared a series of large maps, carefully got up from every source that they could come upon, such as state, county, and town maps, also the information given by residents and refugees, etc., etc. In spite of all this the result has been almost ludicrous! Some places (e.g. Spotsylvania) are from one to two miles out of position, and the roads run everywhere except where laid down. I suppose the fact is that there was no material whatever wherewith to make a map on a scale so large as one inch to a mile. It is interesting to see now how the engineers work up the country, as they go along. Topographers are sent out as far as possible in the front and round the flanks. By taking the directions of different points, and by calculating distances by the pacing of their horses, and in other ways, they make little local maps, and these they bring in in the evening, and during the night they are compiled and thus a map of the neighborhood is made. If the next day is sunny, photographic copies are taken of this sketch and sent to the principal commanders, whose engineers add to, or correct it, if need be, and these corrections are put on a new sketch. Much information is gotten also by the engineers sent with the cavalry. . . .
Theodore Lyman’s letter is from Meade’s Headquarters, 1863-1865: Letters of Colonel Theodore Lyman from the Wilderness to Appomattox, pp.134-7. Edited by George R. Agassiz. Boston, Massachusetts Historical Society, 1922. Available via Google Books. 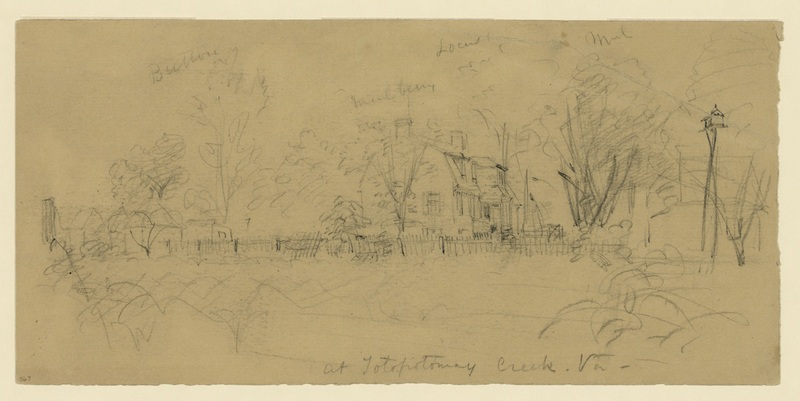 “At Totopotomoy Creek,” a drawing Alfred Waud did around this time 150 years ago. Click to enlarge (Library of Congress). I get the sense of George Meade tossing off quick notes to reassure his wife while his attention and energies are engaged in the huge task of moving his army through Virginia. Theodore Lyman, on the other hand, finds time to pen another long, detailed account of life in a blighted country. Meade first. We are within sixteen miles of Richmond, working our way along slowly but surely. I expect we shall be a long while getting in, but I trust through the blessing of God we will at last succeed, and if we do, I think, from the tone of the Southern press, and the talk of the prisoners, that they will be sensible enough to give it up. They are now fighting cautiously, but desperately, disputing every inch of ground, but confining themselves exclusively to the defensive. Mathew Brady took this photo of Winfield Scott Hancock with his staff and division commanders. Click to enlarge (Library of Congress). It has been a tolerably quiet day, though there was a quite sharp fight at evening on our left — the Rebels badly used up. The people in Richmond must hear plainly the booming of our cannon: they scarcely can feel easy, for we are closing in on the old ground of McClellan. Fair Oaks was two years ago this very day. What armies have since been destroyed and rebuilt! What marchings and countermarchings, from the James to the Susquehanna! Still we cling to them — that is the best feature. There is, and can be, no doubt of the straits to which these people are now reduced; particularly, of course, in this distracted region; there is nothing in modern history to compare with the conscription they have. They have swept this part of the country of all persons under 50, who could not steal away. I have just seen a man of 48, very much crippled with rheumatism, who said he was enrolled two days ago. He told them he had thirteen persons dependent on him, including three grandchildren (his son-in-law had been taken some time since); but they said that made no difference; he was on his way to the rendezvous, when our cavalry crossed the river, and he hid in the bushes, till they came up. I offered him money for some of his small vegetables; but he said: “If you have any bread, I would rather have it. Your cavalry have taken all the corn I had left, and, as for meat, I have not tasted a mouthful for six weeks.” If you had seen his eyes glisten when I gave him a piece of salt pork, you would have believed his story. He looked like a man who had come into a fortune. “Why,” said he, “that must weigh four pounds — that would cost me forty dollars in Richmond! They told us they would feed the families of those that were taken; and so they did for two months, and then they said they had no more meal.” What is even more extraordinary than their extreme suffering, is the incomprehensible philosophy and endurance of these people. Here was a man, of poor health, with a family that it would be hard to support in peacetimes, stripped to the bone by Rebel and Union, with no hope from any side, and yet he almost laughed when he described his position, and presently came back with a smile to tell me that the only two cows he had, had strayed off, got into a Government herd, and “gone up the road” — that’s the last of them. In Europe, a man so situated would be on his knees, tearing out handfuls of hair, and calling on the Virgin and on several saints. There were neighbors at his house; and one asked me if I supposed our people would burn his tenement? “What did you leave it for?” I asked. To which he replied, in a concise way that told the whole: “Because there was right smart of bullets over thaar!” The poorest people seem usually more or less indifferent or adverse to the war, but their bitterness increases in direct ratio to their social position. Find a well-dressed lady, and you find one whose hatred will end only with death — it is unmistakable, though they treat you with more or less courtesy. Nor is it extraordinary: there is black everywhere; here is one that has lost an only son; and here another that has had her husband killed. People of this class are very proud and spirited; you can easily see it; and it is the officers that they supply who give the strong framework to their army. They have that military and irascible nature so often seen among an aristocracy that was once rich and is now poor; for you must remember that, before the war, most of these landowners had ceased to hold the position they had at the beginning of this century. There, that is enough of philosophizing; the plain fact being that General Robert Lee is entrenched within cannon range, in a sort of way that says, “I will fight you to my last gun and my last battalion!” We had not well got our tents pitched before the restless General, taking two or three of us, posted off to General Hancock. That is his custom, to take two or three aides and as many orderlies and go ambling over the country, confabbing with the generals and spying round the country roads. There, of course, was Hancock, in a white shirt (his man Shaw must have a hard time of it washing those shirts and sheets) and with a cheery smile. His much persecuted aides-de-camp were enjoying a noon-tide sleep, after their fatigues. The indefatigable [William] Mitchell remarked that there were many wood-ticks eating him, but that he had not strength to fight them! The firing was so heavy that, despite the late hour, General Meade ordered Hancock and Burnside to advance, so as to relieve Warren. Only Gibbon had time to form for an attack, and he drove back their front line and had a brief engagement, while the other commands opened more or less with artillery; and so the affair ended with the advantage on our side. — The swamp magnolias are in flower and the azaleas, looking very pretty and making a strong fragrance. Meade’s correspondence taken from The Life and Letters of George Gordon Meade, Major-General United States Army, Vol. 2, (New York: Charles Scribner’s Sons, 1913), p. 199. Available via Google Books. Theodore Lyman’s letter is from Meade’s Headquarters, 1863-1865: Letters of Colonel Theodore Lyman from the Wilderness to Appomattox, pp.132-4. Edited by George R. Agassiz. Boston, Massachusetts Historical Society, 1922. Available via Google Books. 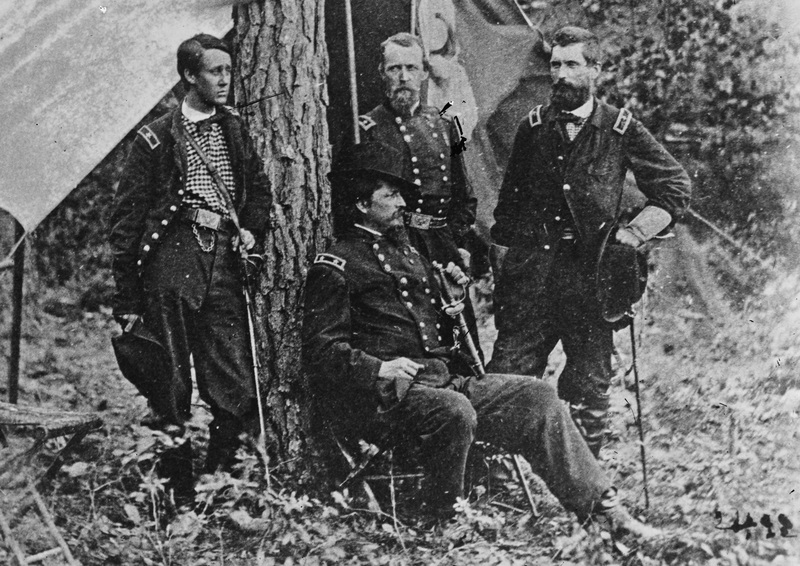 In this image taken at Cold Harbor in 1864, Winfield Scott Hancock (seated) poses with (left to right) Francis Barlow, David Birney, and John Gibbon. Lyman mentions all four generals in his letter of May 20, 1864 (Library of Congress). Col. Martin McMahon (Library of Congress). For a third time the same shrill whistle, closing with a dull, heavy stroke, interrupted our talk, when, as I was about to resume, the general’s face turned slowly to me, the blood spurting from his left cheek under the eye in a steady stream. He fell in my direction; I was so close to him that my effort to support him failed, and I fell with him. 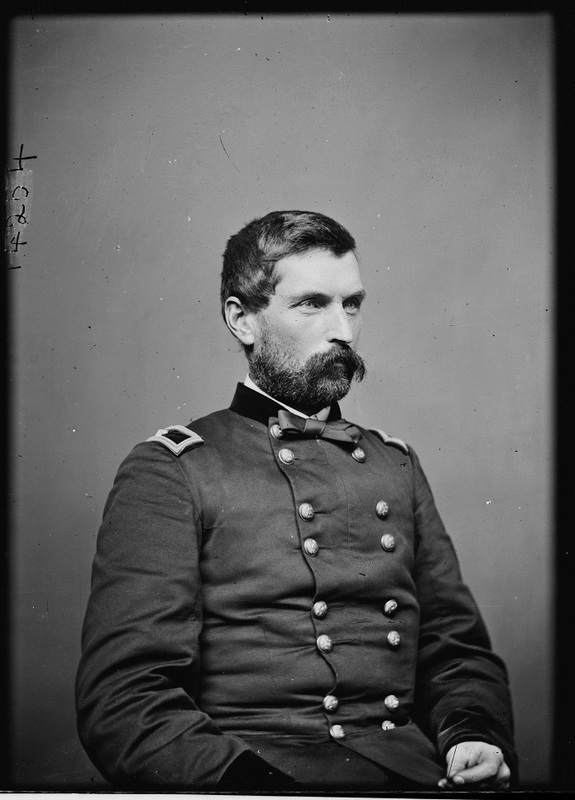 Colonel Charles H. Tompkins, chief of the artillery, standing a few feet away, heard my exclamation as the general fell, and, turning, shouted to his brigade-surgeon, Dr. Ohlenschlager. Major Charles A. Whittier, Major T. W. Hyde, and Lieutenant-Colonel Kent, who had been grouped near by, surrounded the general as he lay. A smile remained upon his lips but he did not speak. The doctor poured water from a canteen over the general’s face. The blood still poured upward in a little fountain. The men in the long line of rifle-pits, retaining their places from force of discipline, were all kneeling with heads raised and faces turned toward the scene; for the news had already passed along the line. 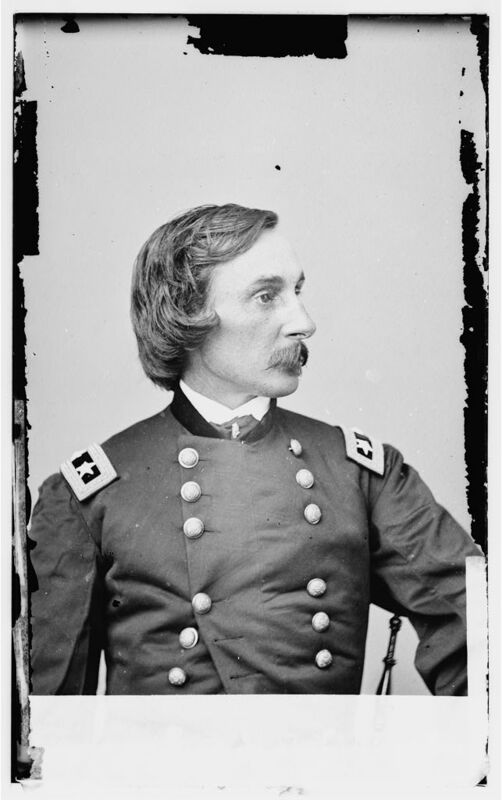 I was recalled to a sense of duty by General Ricketts, next in command, who had arrived on the spot, and informed me, as chief-of-staff, that he declined to assume command of the corps, inasmuch as he knew that it was General Sedgwick’s desire, if anything should happen to him, that General Horatio G. Wright, of the Third Division, should succeed him. General Ricketts, therefore, suggested that I communicate at once with General Meade, in order that the necessary order should bo issued. When I found General Meade he had already heard the sad intelligence, and had issued the order placing General Wright in command. Returning I met the ambulance bringing the dead general’s body, followed by his sorrowing staff. The body was taken back to General Meade’s headquarters, and not into any house. A bower was built for it of evergreens, where, upon a rustic bier, it lay until nightfall, mourned over by officers and soldiers. The interment was at Cornwall Hollow, Connecticut. Now let’s see what Lyman had to say on May 20, 1864. To-day has been entirely quiet, our pickets deliberately exchanging papers, despite orders to the contrary. These men are incomprehensible— now standing from daylight to dark killing and wounding each other by thousands, and now making jokes and exchanging newspapers! You see them lying side by side in the hospitals, talking together in that serious prosaic way that characterizes Americans. The great staples of conversation are the size and quality of rations, the marches they have made, and the regiments they have fought against. All sense of personal spite is sunk in the immensity of the contest. Francis C. Barlow (Library of Congress). In my letter of yesterday I got you as far as the evening of Sunday the 8th. On Monday, the 9th, early, Burnside was to come down the Spotsylvania and Fredericksburg road to the “Gate,” thus approaching on the extreme left; Sedgwick and Warren respectively occupied the left and right centre, while Hancock, in the neighborhood of Todd’s Tavern, covered the right flank; for you will remember that the Rebel columns were still moving down the Parker’s Store road to Spotsylvania, and we could not be sure they would not come in on our right flank and rear. Betimes in the morning General Meade, with three aides, rode back to General Hancock, and had a consultation with him. The day was again hot and the dust thicker and thicker. As we stood there under a big cherry tree, a strange figure approached; he looked like a highly independent mounted newsboy; he was attired in a flannel checked shirt; a threadbare pair of trousers, and an old blue kepi; from his waist hung a big cavalry sabre; his features wore a familiar sarcastic smile. It was General Barlow, commanding the 1st division of the 2d Corps, a division that for fine fighting cannot be exceeded in the army. There, too, was General Birney, also in checked flannel, but much more tippy than Barlow, and stout General Hancock, who always wears a clean white shirt (where he gets them nobody knows); and thither came steel-cold General Gibbon, the most American of Americans, with his sharp nose and up-and-down manner of telling the truth, no matter whom it hurts. . . .
Major General John Sedgwick. His men called him “Uncle John” (Library of Congress). It was about ten o’clock, and I was trotting down the Piney Branch road, when I met Colonel McMahon, Adjutant-General of the 6th Corps; I was seriously alarmed at the expression of his face, as he hurriedly asked where General Meade was. I said, “What is the matter?” He seemed entirely unnerved as he replied: “They have hit General Sedgwick just here under the eye, and, my God, I am afraid he is killed!” It was even so: General Sedgwick, with a carelessness of consequences for which he was well known, had put his Headquarters close on the line of battle and in range of the sharpshooters. As he sat there, he noticed a soldier dodging the bullets as they came over. Rising from the grass, he went up to the man, and, laying his hand on his shoulder, said, “Why, what are you dodging for? They could not hit an elephant at that distance.” As he spoke the last word, he fell, shot through the brain by a ball from a telescopic rifle. . . . 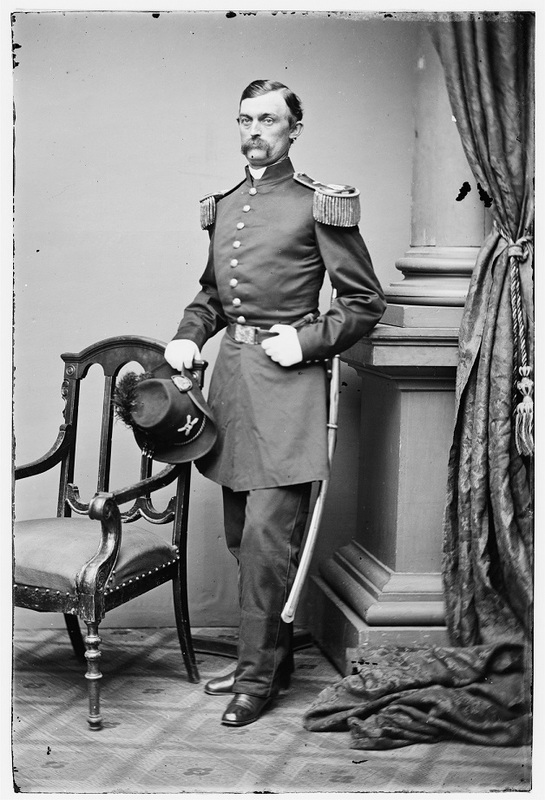 The dismay of General Sedgwick’s Staff was a personal feeling; he was like a kind father to them, and they loved him really like sons. So fell “good Uncle John,” a pure and great-hearted man, a brave and skilful soldier. From the commander to the lowest private he had no enemy in this army. . . . I found General Meade with Generals Wright, Warren, and Humphreys consulting together in the same spot where Grant sat yesterday among the bullets, for no apparent reason. You never saw such an old bird as General Humphreys! I do like to see a brave man; but when a man goes out for the express purpose of getting shot at, he seems to me in the way of a maniac. … In the afternoon there was some fighting on the right centre, without result; Burnside pushed down on the left, driving the enemy before him; and so the day closed, our army crowding in on Lee and he standing at bay and throwing up breastworks. Theodore Lyman’s letter is from Meade’s Headquarters, 1863-1865: Letters of Colonel Theodore Lyman from the Wilderness to Appomattox, pp 106-108. Edited by George R. Agassiz. Boston, Massachusetts Historical Society, 1922. Available via Google Books.